In January this year I wrote a post about several apps I've been trying out that are focused on health and fitness. Now as it turns out I was in the pharmacy yesterday and I came across a leaflet called 10 Steps to an Active You. This leaflet recommended an app called Active 10 which monitors you for 10 minutes of brisk walking (basically the aim is to get your blood pumping and improve your mood). Apparently just 10 minutes of brisk walking can improve your health straight away - though you need to do 15 sessions of these a week since doctors recommend you are active for 150 minutes a week to reduce your risk of long-term health conditions such as heart disease, diabetes, dementia and cancer. Of course the good thing about walking is that you can do it anytime without the need for any equipment at all. 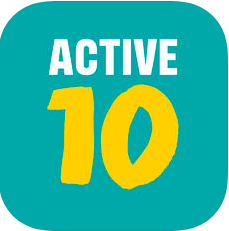 The idea behind the Active 10 app is simply to keep you motivated, with the idea of working up to 30 minutes (three Active 10s) each day. You set your own goals and you increase or decrease them when you want. The app monitors your progress over 7 days and over 30 days. Your progress shows up on various screens, and you can see both how long you have walked for in minutes and then how much of that was brisk walking. I used this app yesterday and today and I did find it motivating. Yesterday I started out with a goal of one Active 10 in the evening, but as I was walking I increased it to two. This morning having completed two Active 10s, I then changed the goal to three. There's an Active 10 website as well. This contains more information and also others apps that are made by the same developers, one of which I have used before as a podcast and which I know has been successful in getting millions of people running worldwide. I already monitor the number of steps I walk as well as the distance I walk and I wondered whether it was possible to use all 3 apps in combination. 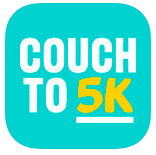 I therefore went and downloaded the Couch to 5K app as well. This app is sponsored by the NHS and the BBC. It's designed for beginners to build up to running for 30 minutes without stopping. This might or might not be 5k depending on how fast you run of course. The programme is a 9-week plan aimed at running three times a week with rest day between each run, though you can repeat weeks if you don't feel you are physically fit to move onto the next one. choose from. Next you will see the wheel which shows you the day's running schedule. This wheel also displays a countdown timer so you can see how much of each section - walk or run - you still have to do. 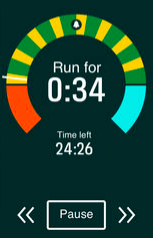 You can use this app in conjunction with your own music, and interestingly, there is a bell that rings when you are half way through your run so that if you are running in one direction rather than a circular route you will know it's time to turn round and run back. So this morning I set off on a walk/run with all 3 apps monitoring my progress. According to the Steps app I spent 51 minutes walking and running 4.5 km - and did about 60% of my daily target of 10,000 steps. The Active 10 shows I managed to achieve today's goal of three Active 10s, and that I walked for a total of 54 minutes, of which 44 were brisk. The Couch to 5K app shows I completed Run 1 of Week 1, but no further information, though since I know the yellow sections on the app are the running sections I can work out that I ran for 8 minutes as today's schedule was "run for 60 seconds, walk for 90 seconds". In general I feel all these apps could be very helpful in motivating someone and keeping them exercising - check back in another 9 weeks to see if I've managed to get myself to 5K and if technology really can help people to get fit and transform their health.